My latest contribution to Torontoist accompanies a piece by Desmond Cole about the possibility of Toronto high schools employing armed police officers. This idea is in the wake of an incident last Friday at North Toronto Collegiate where a group of students were robbed by four teenagers. It was later discovered that one of them was carrying a concealed firearm at the scene where they absconded with two stolen iPods. I don’t wish for this blog to turn political, so my post here will be brief. This incident aside, there are plenty of arguments for and against the presence of armed officers. An argument for would be to properly protect students from possibly violent breakouts involving firearms. An argument against would be that the more guns you bring to a fight, there’s a better chance of tragedy. I think Cole put it eloquently when he mentioned the “unpredictable nature of armed conflict”. Installing police presence within a school seems like a knee-jerk reaction that seems just as impetuous as forbidding nail clippers on an airplane. Fighting fire with fire is indeed a solution to a problem, but surely not the most effective. Instead of bureaucratic cover-all solutions I think there should be a think tank formed, people from a diverse mixture of backgrounds (age, ethnicity, income level, profession, marital status, with/without kids, where they live in the city, where they were born, etc. ), to find creative alternatives instead of, say, blaming Marilyn Manson for teenage aggression. 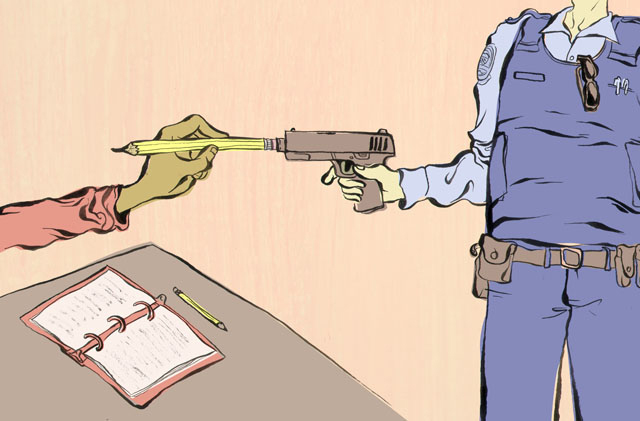 This entry was posted in illustration, news and tagged desmond cole, guns, high school, illustration, police officer, torontoist. Bookmark the permalink.